Nagaland Deputy Chief Minister and leader of state Bharatiya Janata Party (BJP) legislature party, Y Patton was in poll-bound Rajasthan on Monday to oversee the poll preparedness. 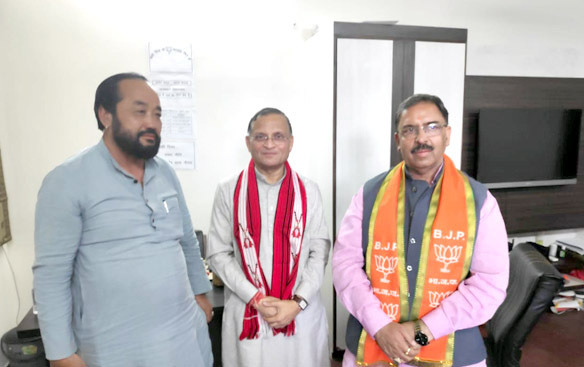 The media cell of Deputy Chief Minister’s office informed that Patton met BJP national joint general secretary Satish Valankar, who is also in-charge of west zone. Patton discussed election related matter and strategy with Valankar and Rajasthan minister Dr Arun Chaturvedi. On behalf of BJP Nagaland, Patton assured the party leadership that members of state BJP unit would shoulder any assignments and responsibilities if entrusted by the party during the electioneering process. He expressed confidence that BJP would retain power in Rajasthan and congratulated Rajasthan Chief Minister Vasundhara Raje for successfully leading the BJP government in the State, the media cell further informed.